You are currently browsing the tag archive for the ‘habitat pole Tempe Reserve’ tag. Fatima Island jusst holding on. One of two new trees planted close to the edge of the rover bank in Kendrick Park. These will provide nice shade & food for wildlife. Discovery Point Wolli Creek looms over us. The wide angle lens flattens the height making the buildings seem less imposing than what they are. Building has not finished yet. Last weekend we took a bike ride from Mackey Park to Kendrick Park & on to Tempe Reserve. 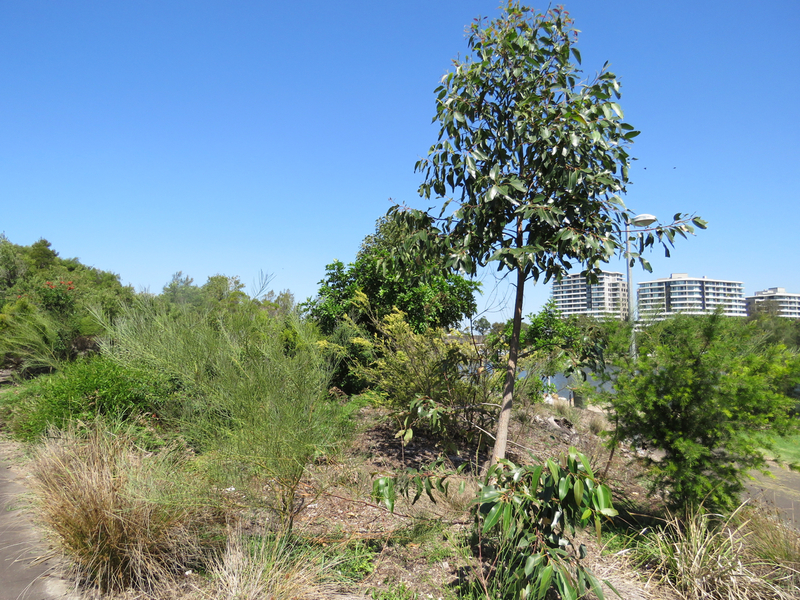 For various reasons, it has been a number of months since we last visited Tempe Reserve. 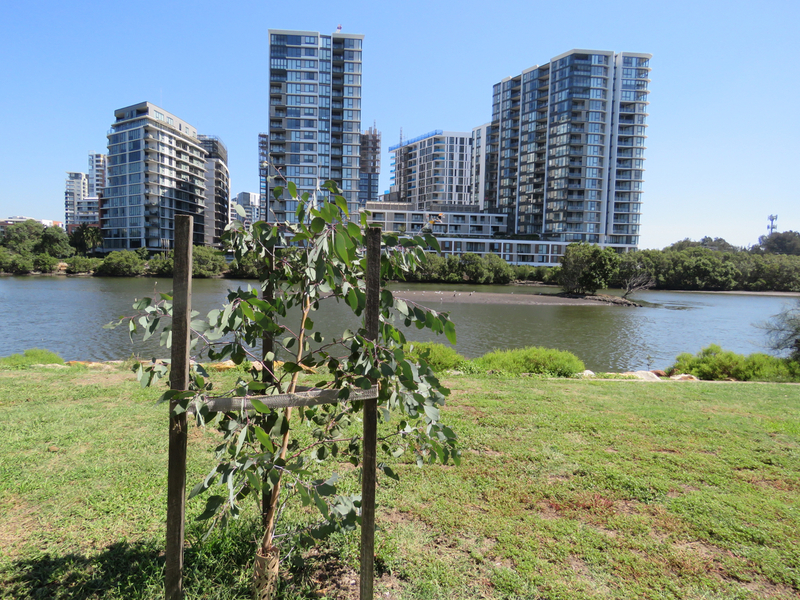 It was great to see two new trees planted close to the riverbank at Kendrick Park. These will replace the trees removed back in 2011 that were in this position. Shade here will improve the amenity of the park, as well as add beauty & habitat/food for wildlife. Looking across to the ever-increasing development at Discovery Point Wolli Creek is perhaps a look at the future for Marrickville & Dulwich Hill. I certainly find it strange to recreate under the eyes of so many just across the river. I think this is something we are all going to have to get used to. It was also wonderful to see that all the new trees planted near to the Princes Highway at Kendrick Park are growing well & have not been vandalised. This is unusual these days. Unfortunately, Fatima Island is holding on by a thread. There are perhaps three trees left. Personally I feel sad that this island is likely to be lost. 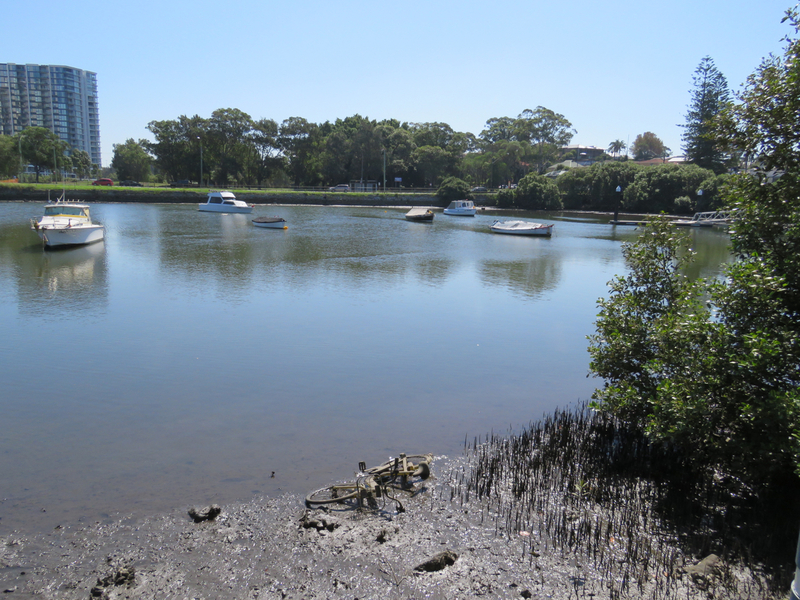 It is a wonderful refuge for waterbirds & only one of two places along the Cooks River where you can always see them when the tide is low. Ofo bike tossed in the Cooks River. 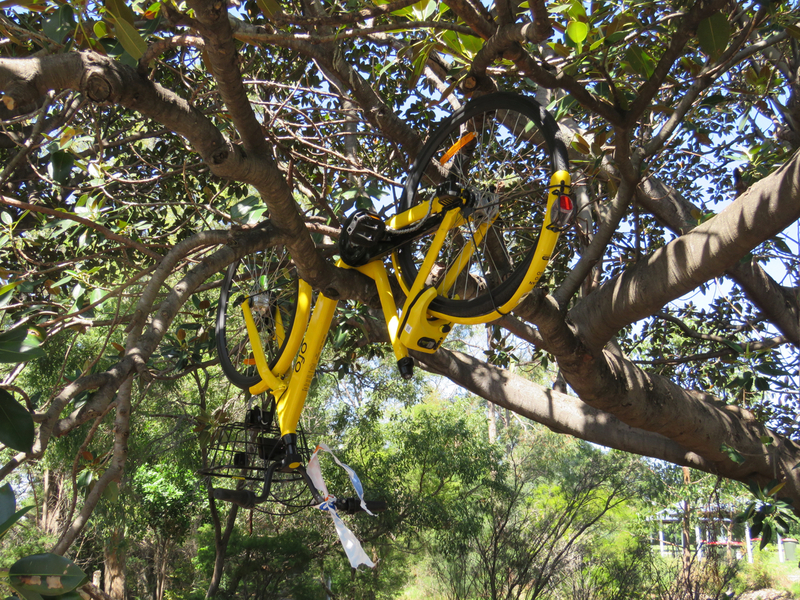 OFO bike placed in a tree at Tempe Reserve. Not good for the bike and definitely not good for the tree. 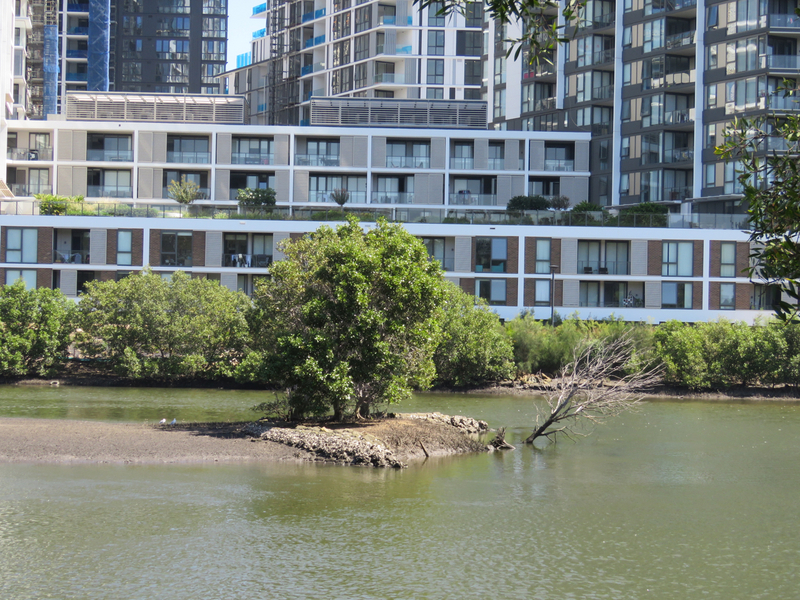 Once we got to Tempe Reserve we saw three yellow OFO Bikes in the river & another high up in a fig tree. Seeing these bikes in the river has become more prominent than shopping trolleys. Council’s planting around the picnic kiosks on the western side have grown well & quite a few Casuarina trees have opportunistically popped up, which is not a bad thing in my opinion. There is plenty of room for more trees in this park. The other area of new trees and understorey opposite the kiosks beside the ‘turpentine forest’ is also doing well having filled out considerably. This pole has had a large section removed from the top and has been bound with steel straps. It was an unintentional split & Council has wrapped many steel bracings around the pole to fix this. I will be very interested to see if any wildlife does set up home in the hollow attached to this pole. Perhaps this has already happened. The bottom of the National Tree Day 2015 site is not doing well. However the top section has shown some progress. 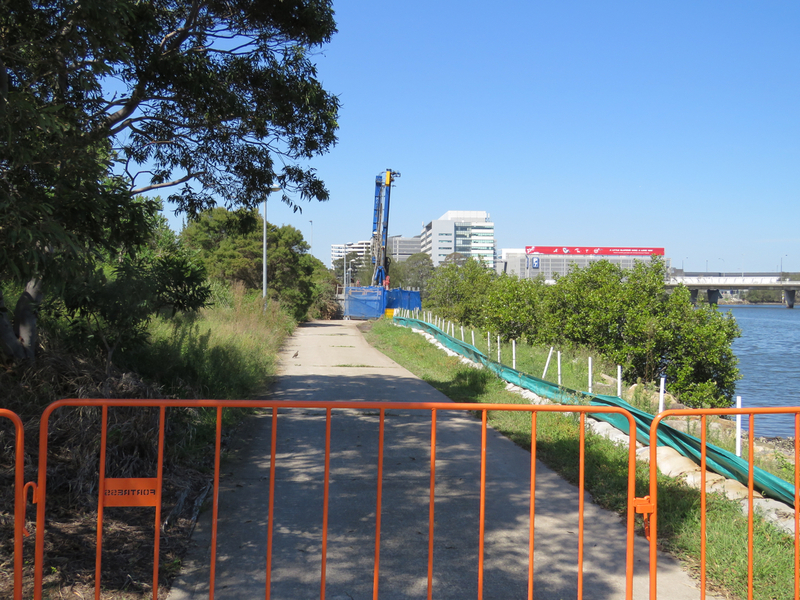 The WestConnex Authority are onsite & have cordoned off a section of the park & the basketball courts to drill & store their equipment. This is not the first time I have seen them drilling here. I think it is felt by the majority of this community that it will be a terrible loss & impact on green space if the motorway runs through or over Tempe Reserve. I am so happy to see this beautiful fig tree doing so well after its roots were exposed by erosion. 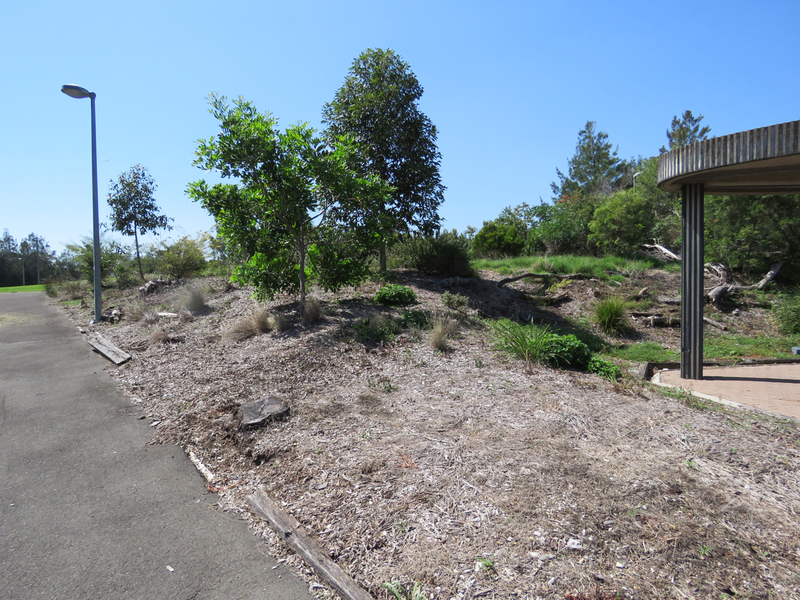 The plantings by Sydney Water are doing well. 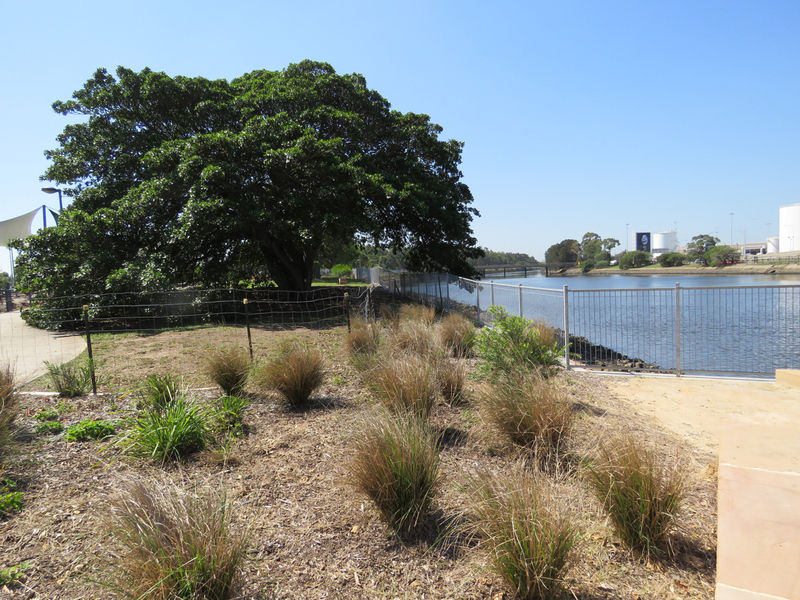 The wonderful work done by Sydney Water to restore the river bank as the Cooks River becomes the Alexandra Canal is looking good. The sedge plantings on the riverbank wall are growing well, as well as all their other plants around the trees. Importantly, the beautiful Fig tree whose roots were exposed to the air & the brackish water of the river is looking very good after being helped. 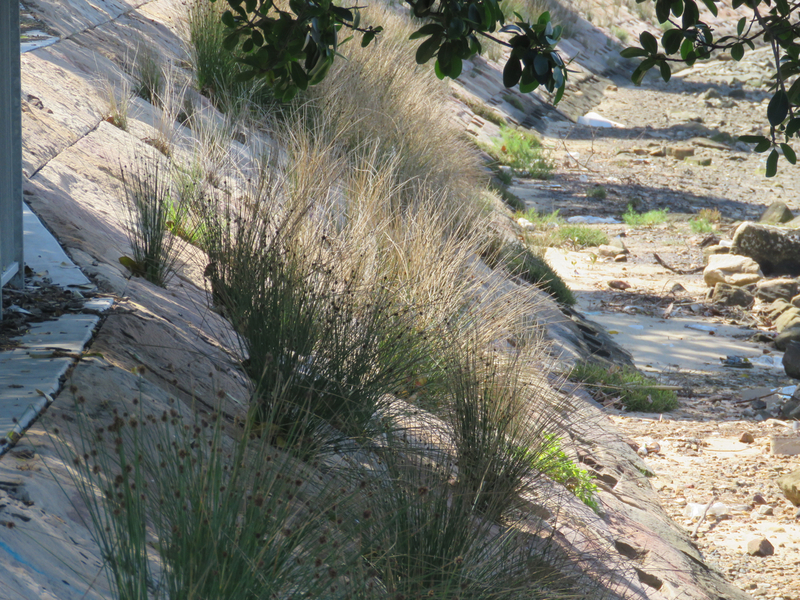 Sedge planting in the new riverbank wall built by Sydney Water. It was low tide when I took this photo. Strange split pole with a nesting hollow attached on the side. I shall be interested to see how this progresses. Last weekend we came across something very interesting at Tempe Recreation Reserve. 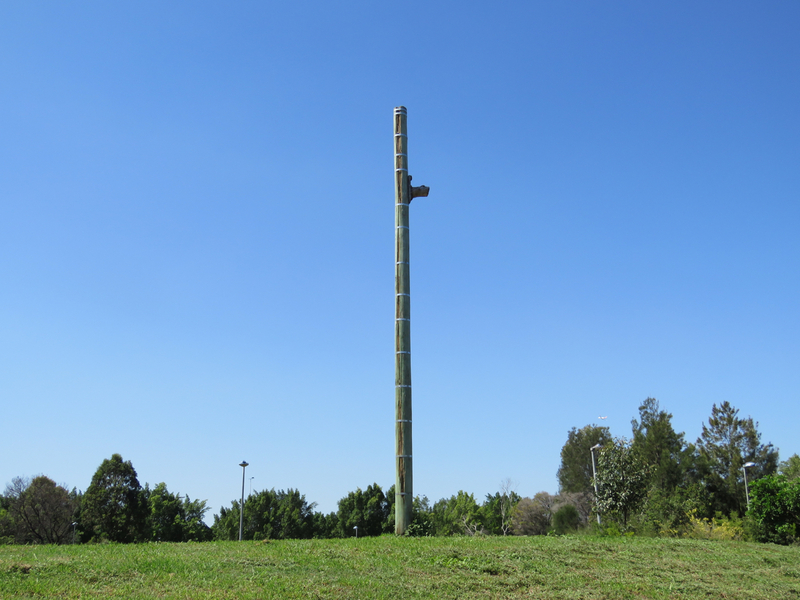 A very tall power pole has been installed in the small hill next to the 2015 National Tree Day site. Half way up the pole a man-made tree hollow has been attached. The pole itself has three splits down its length to around half a metre from the ground. Other people walking in the park joined us to discuss the mystery of the pole. 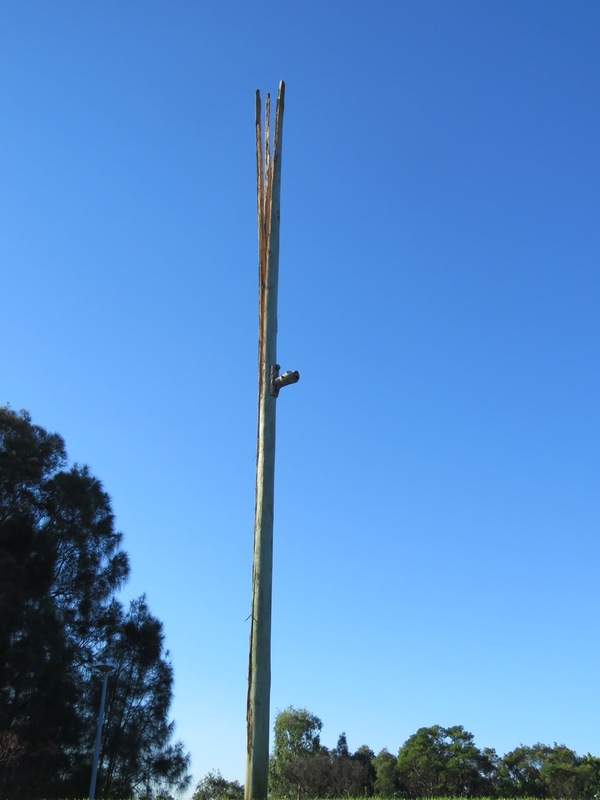 Was it an accident, was the pole meant to be split like this perhaps to offer shelter for microbats or had it been hit by lightning? We decided lightning was out because there had not been a storm in the previous week when they said the pole had been installed. The conversation roamed to microbats because they like to sleep in crevices. The wind was making the sections of the pole move, which I thought might squash any sleeping bats, but I am not an expert of microbat habitat. I could imagine a pole with several of these man-made tree hollows attached at various heights along the pole. High-rise totem pole housing for wildlife & with superb water views. You have got to love that. Red-rumped parrots can often be seen in Tempe Reserve & these birds need tree hollows or nesting boxes to breed. Perhaps they will move in. It is sad that so many trees have been removed in our cities, especially older trees that have hollows, but I am pleased that Inner West Council is concentrating on this issue of hollows for wildlife & exploring creative options. There is no doubt this pole is creative housing for wildlife. 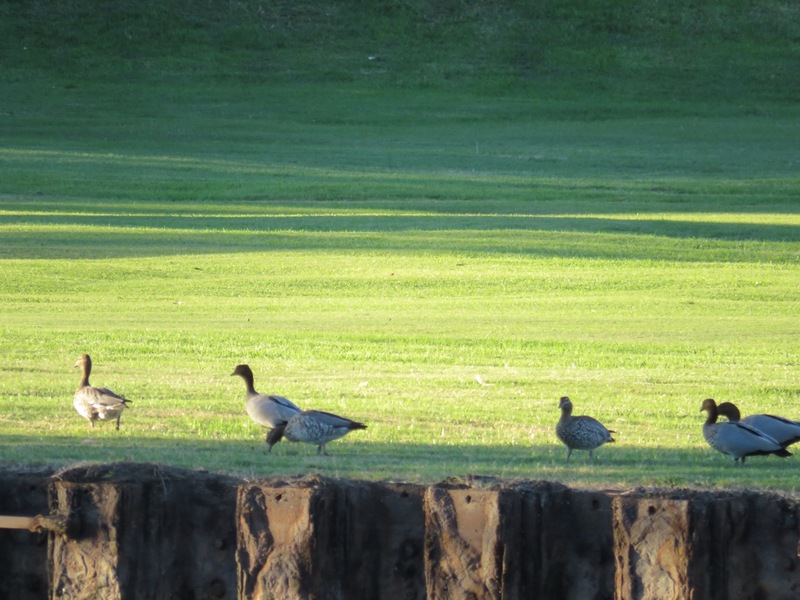 Last month I spotted a family of Australian Wood ducks wandering along the riverbank at the Marrickville Golf Course. This was the first time I have seen Australian Wood ducks along the Cooks River. These ducks breed in tree hollows. Once the fledglings are ready to leave the nest, their parent leaves & the chicks, one by one, take a death defying leap to the ground. Australian Wood ducks walking along the Cooks River in Marrickville Golf Course. There are another three ducks not included in this photo.